The Redneck Swimming hole is back in business this year, although we've only been in it twice because of all the rain and cool weather! Can you believe that Houston didn't hit 90 degrees in the month of May? Crazy and scary 'cause that probably means that this summer is going to be horrendous! After being inspired by this great bar on Pinterest, we knew what our swimming hole was missing - a TIKI BAR!!!! I've been waiting all week for the umbrella to come in so that I could take pictures of the bar to share with you! Wal-mart had some awesome tiki umbrellas but they cost almost $90 !! We found this little beauty on Amazon for only $19.99 plus $5.99 shipping! What a deal and it is the perfect size for our little bar. The bar is made out of 2 old pallets that I had, a piece of wood for the top, 2-12 x 24 ceramic tiles for the top and bamboo plant stakes. 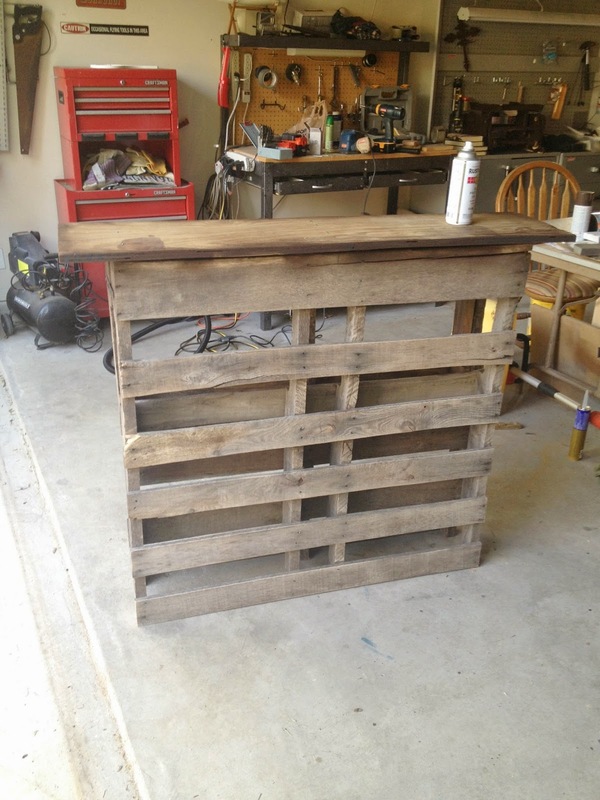 The bar itself cost $35 to make. That included 2 cans of spray paint, metal brackets to join the pallets, Liquid Nails to glue the tiles on and the two tiles. After cutting off about 8 inches from each pallet, we screwed them together and then added the brackets on the side for more stability. After the bar was screwed together and the top screwed on, we spray painted it a dark brown and then glued on the tiles with Liquid Nails. Before placing the bar out by the pool, we placed 2 metal tree stakes where the bar was going and lifted the bar down over them. This keeps everything safe and secure so I don't have to worry about it tipping over. 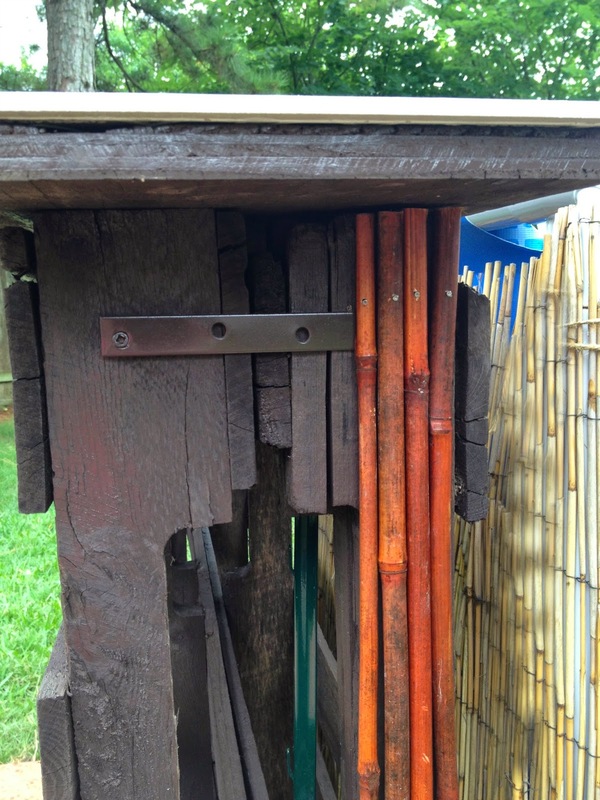 The bamboo was cut to fit, then each piece was held up to the bar, holes drilled into it and affixed with finishing nails. Mr. Crafty had the great idea to use the leftover pieces to make the patterm on the front and that was the perfect finishing touch! This bar isn't made to last a lifetime, but if we get a couple of years out of it, I will be very happy! Now if we could just have a week of sunshine and no rain, we would be able to enjoy it! We're on the Fence! Won't you take a minute and vote for us? I LOVE this idea. We have had Luau birthday parties in that past and this would have been perfect for them. I might just have to make one so I can have another party. :) Thank you so much for linking up to Dare to Share, you are today's Dare to Share Feature of the Day! Thanks so much for the shout out Pam! I'm trying to figure out where we can put another one in our backyard! Thanks Julie! It is just perfect for drinks, suntan lotion, towels and the all important pool accessory - cell phones! LOL! l love it. Thanks so much for stopping by. I have wanted to visit but lost you girls. I am following you now so I won't loose you again. LOL. Thanks Sherry! We haven't been posting as much lately - you know how life gets in the way of everything fun! Welcome back and have a great weekend! Wow! Thanks so much Angela! We appreciate the shout out and thanks for hosting the fabulous party! Love it--pinning it! Thanks for linking up! Thanks Becky! Hope you have a Fantastic Weekend! We love it! Swam tonight and even though we didn't really need the umbrella, I just had to put it up so I could enjoy looking at it! Thanks for hosting the party! 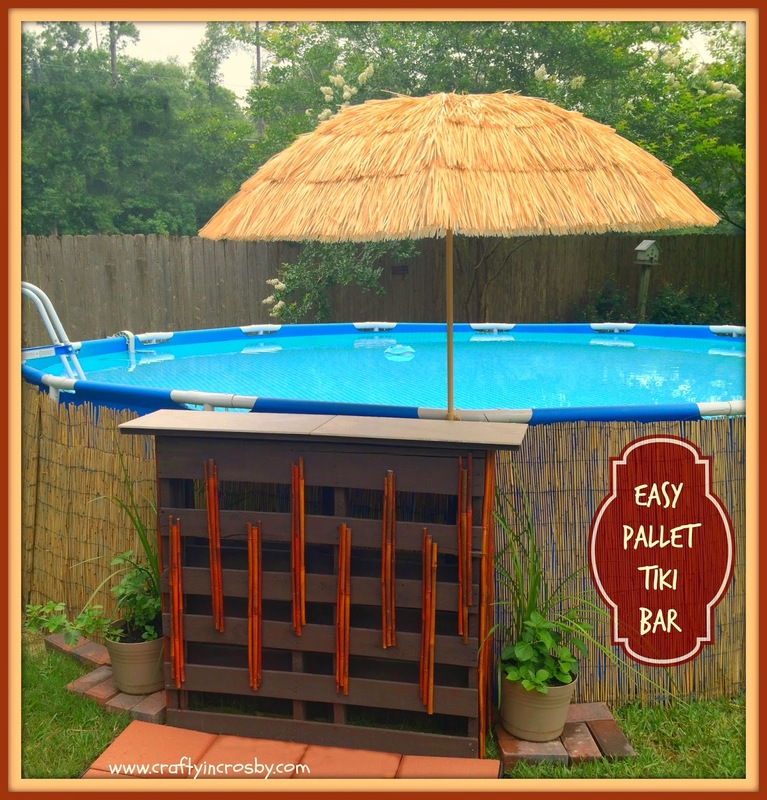 What a great idea...and guess what...I have pallets and a pool. I also love what you did around the sides. Another guess what....my Mom & Step Father live in Crosby...visit there often!! Thanks for the ideas!! Pinning it! Thanks Bobbie! We added stools to it today and now is just perfect! We love living in Crosby - has your Mom lived her long? Hope you have a fabulous weekend. My Mom has lived there for maybe 4 years now, she moved there after marrying my Step Father. He's lived there forever. They live outside city limits. Thanks and I hope you're weekend is going great! I love it, so cute and so cheap! Hello from the Thursday Favorite Things. We are all about CHEAP out here! For some reason, I seem to love projects just that much more when they only cost a few dollars!!! Thanks for stopping by! What a cute idea! May need to dig out some of my pallets!! Would look cute out by our pool; the weather sure has been hot and humid, I live in Huffman, quite close to Crosby!! Just found your blog.....thanks so much! Howdy neighbor! I'm hoping all the darn rain will hold off tomorrow so that we can get out and enjoy it this weekend! There is nothing like a dip in the pool to cool off and escape the nasty humidity. Now if I can just figure out a way to keep the horse flies and mosquitoes away it would be perfect! Innovate idea! We have a similar type pool and I love it. Stopping by forjm Inspire me Monday! Thanks Terri! This is the third year for our little pool and we just love it! Appreciate you taking time to stop in and say hello! I absolutely LOVE LOVE THIS! May I ask where you got the reeds from? The bamboo on the bar came from Big Lots. They are plant stakes. 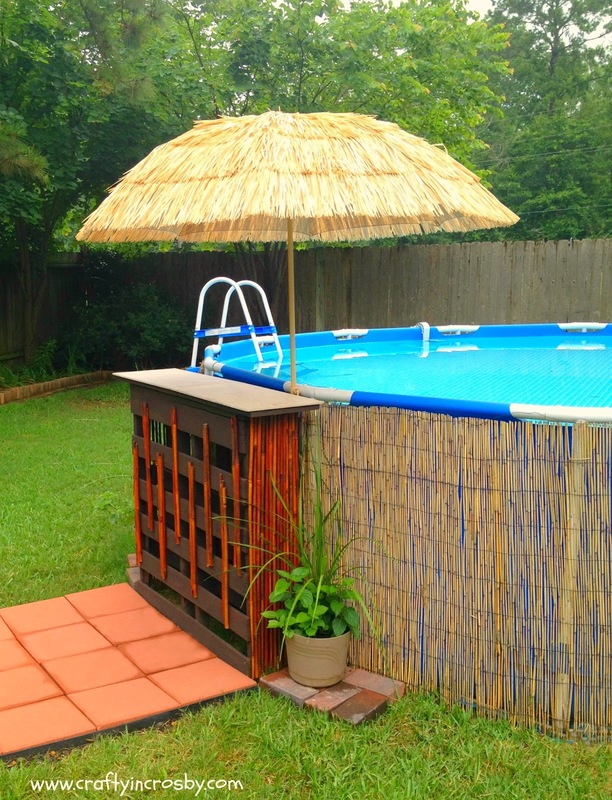 The reed fencing on the pool came from Lowes in the fence section. It was $25 a roll and took 2 rolls to go around the pool. You can see our post with directions under our Home Decor tab. Thanks so much for stopping by! I just pinned this fun idea and scheduled it for Facebook for this afternoon as one of our great features at Freedom Fridays!! Hugs and thanks for sharing!! PS From one fellow Texan to another!! Thanks so much Evelyn! We sure appreciate the shout out! Yours is awesome - just love the glossy red top! I just don't know why I didn't think of this last year or the year before. It is just the best accessory ever for our little pool. So happy that we inspired you! Come back soon! I have completed my bar but where do you get the red bamboo? They are actually plant stakes that I bought at Big Lots last year. I was at Michaels today and think that they have some that would probably work. I would love to see a picture of yours. Maybe you could email it to me - jeanette@craftyincrosby.com Sure hope you can find some! I love this! We are about to do something like this- Where did you get your bamboo screen?? Also, fun fact. I was born and raised in Liberty, Tx! Found this on Pinterest and then squealed to my husband: "They're from CROSBY!!" Hi Lizzy! Liberty is such a pretty little town! We go to the Opry House on the square every chance we get. The screen around the pool came from Lowes. It is $25 a roll and took 2 rolls for our pool. The bamboo on the tiki bar is a package of plant stakes that I picked up at big lots. We are going to be putting the pool back up in a week or two, that is, if it every quits raining! Good luck with yours! Hope you enjoy it as much as we do ours! Hi Rednecks !! .) I just found your swimming hole and Tiki bar in my HGTV Inspiration email. I love both and i just happen to have 4 pallets down in my basement. 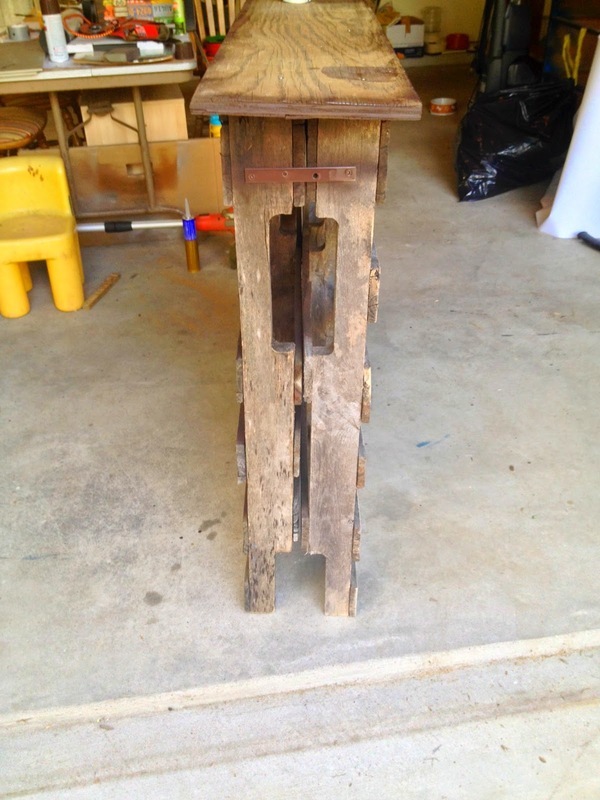 I also have 2 outdoor barstools that are wicker inspired. So this will be my project this weekend, I'm so excited ! Thanks for the inspiration and if i can talk my husband into it, we will have a Redneck inspired pool before summer ends. I realize your post is 3 years old, how is it holding up ?? Do you have a filter and heater ?